Let the sunlight filter through with a great classic look suitable for many types of building from retail, to office, to residential. 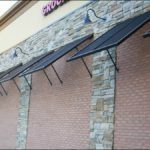 Architectural Shade Products has developed a Bahama Shutter suited specifically for awning type applications. They are designed to be mounted in a fixed position at a range of angles from vertical to 60 degrees from vertical. The standard shutter design has 2” square, 3/32” sidewall, aluminum tube frames. 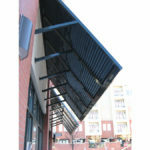 Depending on the shutter width and local building code we may install one or more I-Beam mullions to help support the louvers. The standard louver is a 5/16” x 2-1/2” oval shape extrusion with a 1/16” sidewall. The louvers are inserted into holes machined into the side-rails and mullions for a secure rattle-free assembly. 1” square or 1” x 2” rectangular tube supports the shutter at the desired angle. Using this standard detail, you can combine shutters mounted side by side for basically any width required and the height of the shutters can be up to 12 feet tall. 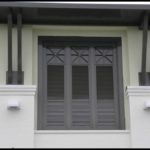 If a taller shutter is required we can accommodate that as well with custom solutions. We invite you to contact us to discuss your unique project requirements. 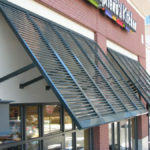 ASP Bahama Shutter Awnings are made of 6063-T6 aluminum for the best combination of strength and corrosion resistance. 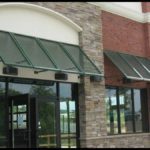 ASP currently offers installation of our Bahama Shutter Awnings in Georgia, Alabama, South Carolina, North Carolina, and Tennessee. 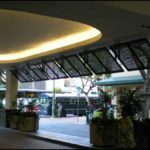 If your project is outside those states, we can ship the Bahama Shutter Awnings pre-fabricated and pre-finished to your job site with easy to follow installation instructions.